You'll have to print it from their page, I wasn't able to print and scan it for you. 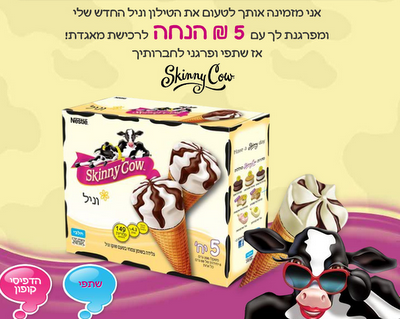 Don't forget to print out your Skinny Cow Ice Cream Cone coupon! It's good for a 5 NIS discount, and expires at the end of August! So hurry up, and even if you're dieting, save some money on ice cream! Enjoy your cool, refreshing treat. I know I could totally use another way to cool off this summer. I don't eat much ice cream, though. Don't forget to check the coupons!